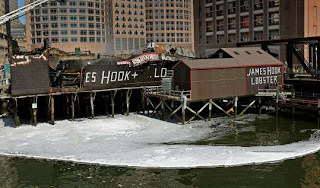 City officials will meet today with the owners of the James Hook & Co. lobster business to discuss ways to keep the iconic waterfront establishment open for business in temporary quarters, perhaps with a retail tent or trailer on the site of its burned building and a wholesale operation in the city's Marine Industrial Park. Investigators have wrapped up their on-site probe of the burned-out lobster warehouse on the corner of Atlantic and Northern avenues, but by yesterday they had not determined the cause of Friday's fire, said Boston Fire Department spokesman Steve MacDonald. Even as the investigation continued and demolition crews prepared to tear down wreckage at the site yesterday, the business of buying and selling fresh lobsters continued. Employees of the family-owned business took orders and arranged shipments with the help of two lobster firms at the city's Marine Industrial Park. The owners have vowed to rebuild on their original site, among Boston office towers. Within a day of the fire, competitor PJ Lobster offered tank space for the storage of live lobsters, and distributor Nagle Seafood offered office space at the Marine Industrial Park. With those basic elements in place, at least temporarily, the wholesale business was brisk, one of James Hook's co-owner's said. Hook family members said their building was insured and would be rebuilt, but they were not sure if the $750,000 to $1 million of lobsters lost in the fire would be covered. Yesterday, they were selling fresh lobsters brought in Sunday. "We're conducting the wholesale end of the business as usual," Al Hook said. "It was pretty hectic getting set up in the new office and the new facility for the packing of lobster, but overall it's been a pretty good day business-wise." About five employees are working out of the borrowed office space, assuring customers the 83-year-old family business will continue to fill orders. Hook said the business was still hoping to bring back all of its dozen or so employees to work in the temporary digs. The retail side of the business, which offered customers a look at some of the lobster shipped in from Maine and Canada, along with fresh lobster rolls and dinners, was closed. Al Hook said owners are hoping the city will allow the a temporary retail store, either in one of the smaller buildings left standing at the site or in a trailer or tent. "I hope they will," he said. "They promised to help us any way they could." Susan Elsbree, a spokeswoman for the Boston Redevelopment Authority, said that as long as the site is safe, the city would be open to expediting the permitting for such an arrangement. In the immediate aftermath of the fire, Mayor Thomas M. Menino promised to help the company's rebuilding, calling it an icon in the city. "The mayor has asked us to do whatever we can on all fronts to ensure that their distribution, their office, and their retail needs are addressed," Elsbree said. She said BRA officials would meet today with James Hook & Co. officials to discuss possible sites at the city-owned Marine Industrial Park for longer term temporary office and storage space. While the other lobster businesses have been "overwhelmingly generous," Elsbree said, she said it was not clear how long they would be able to keep up that level of assistance. While the details still are being worked out, the city will probably offer space in the park for free or at minimal cost, she said. It took more than 135 firefighters, a scuba team and a Massachusetts Port Authority fireboat to douse the 7-alarm fire, reported at about 3 a.m. Friday. The investigation into the fire continued with assistance from Boston police and the Bureau of Alcohol, Tobacco, Firearms and Explosives, MacDonald said.